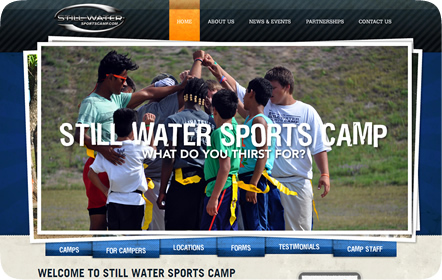 Still Water Sports Camp is a Christian overnight summer and sports camp dedicated to changing the lives of their campers through sportsmanship, leadership and spiritual discovery for boys and girls between the ages of 8 and 16. 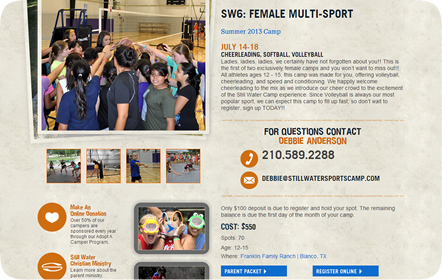 Still Water Sports Camp has three different facilities for rent in Blanco, Columbus and Leakey, Texas for their summer camps. 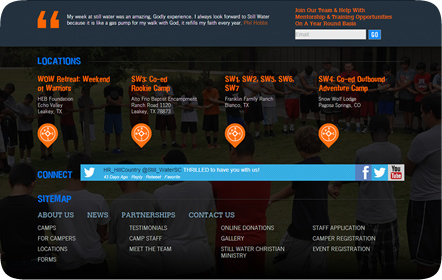 This Christian-based summer camp is a nonprofit organzation that is part of Still Water Christian Ministries. 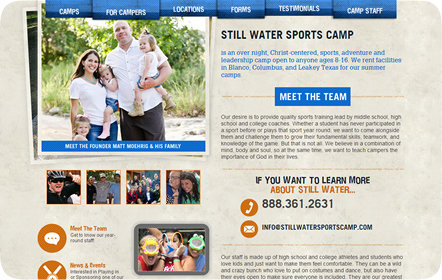 With no particular design idea or limitation in mind, Still Water Sports Camp allowed us to be as creative as possible for their new, completely redesigned website. A major driving factor for their new website was organization. 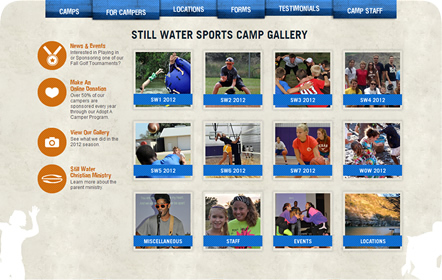 Still Water hosts a wide variety of summer camps that rotate and change every year. We needed to create a functional website that would be easy to follow and easy to update and organize to make it user-friendly. 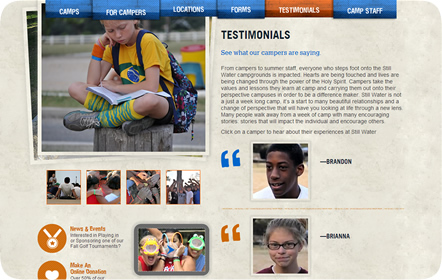 Along with the overall website, we custom-designed many of the icons used throughout the Christian summer camp’s website. Make sure to check out all of the website's extra features, like integrated videos and animated rollover buttons!